Facts about The Queen of the United Kingdom and other Commonwealth realms. The full name of The Queen is Elizabeth Alexandra Mary. The Royal Family and royals from the House of Windsor rarely use their surnames. THE QUEEN: Queen Elizabeth II was born on the 21st of April 1926. The Queen's accession to the throne took place in 1952 and she is the longest-reigning UK monarch. You can get a telegram as a personal message from Queen Elizabeth ll. British nationals can apply for a birthday or anniversary message sent by The Queen. But, only certain birthdays and anniversaries qualify. Telegrams have been used for international messages since 1981 in the UK. A telegram is a message sent by telegraph and later delivered in a printed or written format. Up to 3 weeks before your birthday or anniversary date (5 weeks for online applications). Up to 6 months after birthdays or anniversaries for belated messages. For someone celebrating their 100th birthday. For those who celebrate a 105th birthday. For each birthday celebration for every year that follows their 105th. You can apply for Queen's message online or download and complete the application form. 60th wedding anniversary telegram from the Queen (diamond wedding telegram). 70th wedding anniversary card from the Queen (platinum wedding telegram). For each anniversary that follows their 70th. What Happens if the Person Lives in Australia, Canada, or New Zealand? In this case you should apply directly to the Governor-General. Contact the Anniversaries Office for further details. UK phone call charges chart. The Queen recognises significant milestones of British nationals. Queen Elizabeth ll sends celebratory wishes to thousands of people every year. The personal messages include a birthday or wedding anniversary card from The Queen. They get sent on behalf of The Queen to help them celebrate significant milestones in their lives. 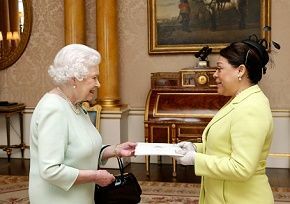 Receiving a congratulatory card from Her Majesty Queen Elizabeth is a memorable part of any celebration. The Anniversaries Office at Buckingham Palace arranges most deliveries. It is a continuing tradition dating back to 1917. A cherished congratulatory card has a personalised message from The Queen. As one would expect, it is befitting to learn that your letter from the Queen arrives in a 'royal' envelope.